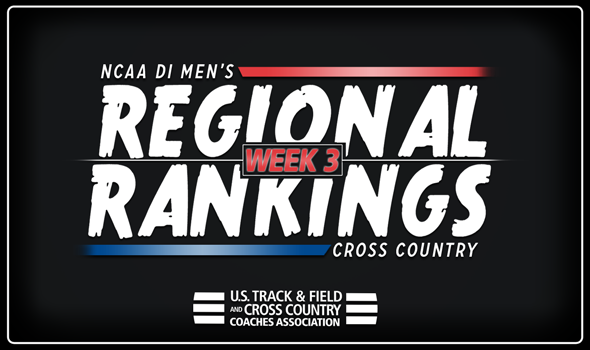 NEW ORLEANS – We’re slowly beginning to see some changes populate in the NCAA Division I Men’s Cross Country Regional Rankings. One week before the busiest weekend of the 2018 season, 11 teams shifted spots in four combined regions with the Southeast Region seeing the most alterations between Week 2 and the Week 3 installment that was released Monday by the U.S. Track & Field and Cross Country Coaches Association (USTFCCCA). What makes this weekend so special? Here is a list of meets that will take place, in no particular order: Nuttycombe Wisconsin Invitational, Paul Short Run, Greater Louisville Classic, Roy Griak Invitational, Joe Piane Invitational, Stanford Invitational. There were no changes to the top-5 of the Great Lakes Region: Wisconsin remained No. 1, followed by Michigan State, Indiana, Michigan and Notre Dame. Three of these teams – Wisconsin, Indiana and Michigan State – will be in action at the Nuttycombe Wisconsin Invitational, while Notre Dame hosts the Joe Piane Invitational. There were no changes to the top-5 of the Mid-Atlantic Region: Princeton remained No. 1, followed by Villanova, Georgetown, Penn State and Penn. All five of these teams will be in action at the Nuttycombe Wisconsin Invitational. There were no changes to the top-5 of the Midwest Region: Iowa State remained No. 1, followed by Oklahoma State, Minnesota, Bradley and Tulsa. Four of these teams will compete at the Nuttycombe Wisconsin Invitational, while Minnesota hosts the Roy Griak Invitational. There were no changes to the top-5 of the Mountain Region: Northern Arizona remained No. 1, followed by BYU, Colorado, Colorado State and Southern Utah. Northern Arizona, Colorado, Colorado State and Southern Utah will be in action at the Nuttycombe Wisconsin Invitational, while BYU travels to the Joe Piane Invitational hosted by Notre Dame. There was one change to the top-5 of the Northeast Region: Dartmouth jumped two spots from No. 7 to No. 5 and takes up residence behind No. 1 Syracuse, No. 2 Iona, No. 3 Stony Brook and No. 4 Columbia. The Big Green ran well at the Coast-to-Coast Battle in Beantown and finished ahead of Providence and UMass Lowell, both of whom were ranked ahead of it in the previous installment. The biggest change in the South Region came in the form of Ole Miss moving up from No. 3 to No. 2. This past weekend the Rebels finished third as a team at the Coast-to-Coast Battle in Beantown as they put three runners in the top-15. Ole Miss supplanted Middle Tennessee State as the biggest challenger to top-ranked Alabama. Florida State and Tennessee round out the top-5 in fourth and fifth, respectively. Alabama and Tennessee will compete at the Wisconsin Nuttycombe Invitational, while Middle Tennessee State heads to the Greater Louisville Classic and Florida State travels to South Bend, Indiana. There were no changes to the top-5 of the South Central Region: Arkansas is still No. 1 after dominating the Chile Pepper Festival and is followed by No. 2 Texas, No. 3 Texas A&M, No. 4 Rice and No. 5 McNeese State. The Longhorns have the best change of opening some eyes this weekend as they’ll be the lone team in the top-5 of the region at the Nuttycombe Wisconsin Invitational. If you like change, feast your eyes on the Southeast Region. Virginia is ranked No. 1 for the first time since Week 6 of the 2016 season. The Cavaliers finished a strong fourth at the Coast-to-Coast Battle in Beantown this past weekend and were led by Brent Demarest, who finished in seventh place. NC State moved up to No. 2, followed by Furman at No. 3. Liberty comes in at No. 4 and Charlotte rounds out the top-5 at No. 5. Hurricane Florence ravaged a lot of these teams’ schedules, but we should see nearly all of them in action this upcoming weekend across the nation. Portland and Stanford remained No. 1 and No. 2, but Washington jumped up four spots from No. 7 to No. 3 after its performance at the Coast-to-Coast Battle in Beantown. The Huskies finished runner-up behind meet champion Syracuse and put its entire scoring lineup in the top-25, led by Oregon transfer Tanner Anderson. This is the highest Washington has been ranked in the West Region since it was No. 3 in Week 3 of the 2016 season. Oregon and Washington State round out the top-5 in fourth and fifth, respectively.